Looking for a home in Hawaii? Check out the west side of Oahu. According to a new study, Kapolei and Ocean Pointe are the best places for homeownership in Hawaii. The financial services website NerdWallet analyzed Hawaii’s neighborhoods based on housing affordability and availability and the area’s potential for growth. 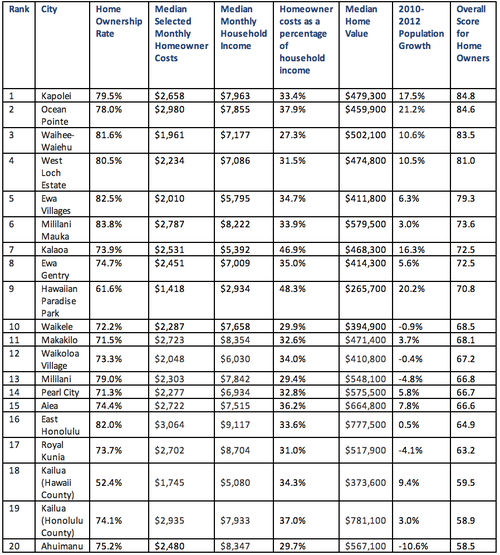 The analysis found that in Kapolei, monthly homeownership costs make up about 33 percent of monthly household income. The area is also expected to continue to grow because it is the site of a planned Honolulu rail station. Out of all the neighborhoods analyzed, monthly homeownership costs were lowest in Waihee-Waiehu in Maui, which came in third on the list. The cost of owning a home in that area is only about 27 percent of monthly household income, the study found. To learn more about NerdWallet’s top 20 neighborhoods for homeownership in Hawaii, click here.